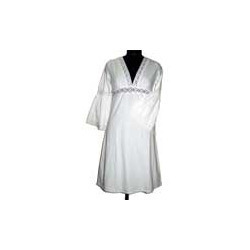 We are the Leading organisation to manufacture White kaftans. The exotic assortment of White Georgette Kaftans is created from light weight silk of most premium quality silk Georgette. These can be worn in different climates and for special evening occasions. We use a very exclusive variety of adornments in this range, which makes the lady feel like an evening princess. These are offered in a wide hue of colours to our customers. 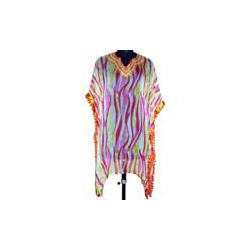 With immense industry experience, we are offering a beautiful range of Kaftan. This Kaftan is broadly admired among the clients owing to its alluring design, eye-catching colors and optimum softness. Additionally, our best quality experts specially take care on the overall quality and finish of these Kaftans. We offered entire range in customized options also, to suit the precise requirements of our customers at affordable rates.